Next week I’ll be heading to Oklahoma for a mini speaking tour. I’m excited to visit a state I’ve never been to, as well as engage with activists dealing with progressive politics in a decidedly red state. The first event, on January 21st, is a symposium hosted by Oklahoma State University in Stillwater. I’ll be speaking on a panel in the afternoon called Birthing Rights and the New Eugenics, alongside Lynn Paltrow and Andrea Smith. I’m very excited to speak alongside those two incredible folks, and especially Lynn, who gets serious credit for inspiring me to start this blog. I’ll be talking about abortion doula work and the full-spectrum doula movement. Then on Monday I’ll be visiting the University of Oklahoma in Norman. There I’ll be giving my talk, Feminism’s Identity Crisis. The cool flyer that Stephanie at the Center for Social Justice made is below. 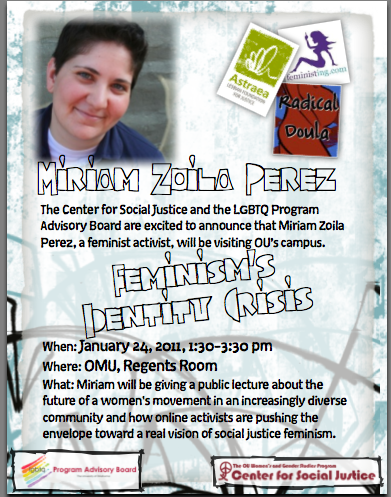 In case you are in Oklahoma, the event is on January 24th, from 1:30-3:30pm in OMU, Regents Room. I’ll be spending the weekend in the OKC/Norman area, so if you know of cool things to do or places to visit I’m open to suggestions! Thanks to OSU and OU for inviting me. These two events are the start of my spring speaking gig. I’m still booking new events, so if you’re interested in bringing me to your campus or community, get in touch. It was wonderful to meet you and to hear about your work. Thanks so much for coming to Oklahoma! Good luck speaking today! It’s great that you are introducing these topics in a regions that are normally desolate of such subjects.